To become a transformative education provider in Asia for a digital world. To design and facilitate learner-centered education and professional development that responds directly to the needs of the regional market, the changing digital environment, and the global context. Our values are the things that we think are important. They are the foundations on which our practice is built. These value statements unite us as colleagues and as pedagogues. Our working lives and teaching methodologies are built around these 6 elements. At Hyper Island learning isn’t contained in a classroom. Through our constructivist methodology, we provide students with the tools to support critical thinking, to approach problems with openness and curiosity for a changing world. Through market research and active involvement of industry partners, Hyper Island primes people to anticipate complex social and business needs, driven by new insights into industry trends and transformative technology. Tomorrow’s leaders will be those who embrace ambiguity, adapt swiftly to new paradigms, and lead by action, not rhetoric. Students and staff are trained in self-leadership and change management. We empower passionate participation by challenging students and staff to set ambitious goals and take ownership of their own learning and working. Diversity, inclusion, and openness are crucial to effective teamwork. Students work in groups throughout all courses, using reflection and feedback to excel in collaboration and outcomes. To be active participants in business and technological innovation, students are encouraged to question the status quo and think about global challenges in an entrepreneurial way. Our culture defines the ways in which we live our values. These are the things that we do in order to achieve our mission and move towards our vision. Trust and openness provide the basis for constructive working. They enable members of the group to talk directly and clearly with each other. Effective feedback is crucial for building good working relationships. This is interpersonal, clear and direct, and focused on performance. Reflective practice is part of our learning and working methodology. By reflecting on previous experiences we maximise learning for individuals and groups, and take those learnings forward into future tasks. Building things, concepting, putting forward ideas, and having those ideas challenged and built on is central to our constructivist pedagogy and practice. Self-leadership is what we strive for. Living and acting our values, supporting co-workers on a professional and personal level, confronting issues when they arise, being positive role models, and ultimately taking responsibility for our actions. We are all part of a team, and active participation in teams at all levels allows us to tap into collective intelligence. We participate through our actions, attentive listening, and open questioning. We work with group dynamic theories to understand how we can work more effectively together. We are catalysts for change in education and business. We work with emergent technologies and organizational practices to disrupt current modes of thinking. We fundamentally don’t believe in there is one answer to a problem, so we embrace chaos and complexity to find novel solutions and champion alternative viewpoints. We are passionate about empowering people and organizations. We live this passion through our design and facilitation, and our students show their passion through their work. Melanie has spent her career at the convergence between marketing, technology and data to influence clients’ businesses. She’s worked in the luxury sector with Lexus on digital marketing, Richemont on e-commerce and Sheseido on data analytics. Before Hyper Island, Melanie started her career in London as a junior data manager and swiftly graduated through the ranks of London’s top agencies and consultancies, before moving into digital business transformation in Singapore. Her message: Fear not AI, Quantum Computing, Additive Manufacturing, Blockchain or the next technology behemoth. My sweet spot is figuring out how these leaps can improve productivity, tailor experience and scale the human touch. She is a much sought-after speaker and a life-long learner. Full UK Professorship for 10 years (Kingston University, London) and co-founder Hyper Island. Experienced educator and digital expert particularly in e-commerce and mobile space. With over 15 years of commercial experience and 25 in higher education: troubleshooting failing projects and designing innovative ways of engaging learners in mashups, mobile, retail and usable and online businesses. Strategy, project management, e-commerce, mobile business, data analysis, new businesses development, curriculum development, rapid prototyping. The MA Digital Media Management is a post-graduate, Master of Arts degree recognized and accredited by Teesside University, a partner in the Skillset Academy Network. In 2010 Teesside was voted university of the year. Hyper Island in Singapore is registered with the Committee for Private Education (CPE) as a Private Education Institution under the provisions and regulations of the Private Education Act 2009 in Singapore. Our Singapore Campus is located on 991B Alexandra Road, a short walk from Labrador MRT station, right opposite the PSA building. The space is 4,800 s/f and it has been designed to inspire and enhance learning experiences. In the soundproof classrooms and plenty of studio space we get to collaborate and explore. The floor area is 52.7m² and maximum student capacity per classroom is approx. 35. Per CPE regulations, all students must be covered by Fee Protection Insurance. In the event that the school is unable to complete the course for whatever reason, the student may receive full refunds for the amounts paid. Hyper Island Institute of Higher Education has a Industry-Wide Course Fee Protection in place. Hyper Island has appointed Lonpac Insurance Bhd as our IWC insurance provider. Information on IWC are informed to students through the student handbook and website. Hyper Island uses CPE’s standard PEI-Student Contract. Students can refer to the CPE website. Hyper Island will provide every accepted student with a contract that they will have to complete sign and return, as proof of acceptance into the programme. Hyper Island in Singapore has a feedback/complaints policy and procedure in place to manage any complaints from students that may arise. However, should the student not be satisified with the outcome of their complaint, there is a Dispute Resolution Process in place. If your complaint remains unsolved or if you are not satisfied with the outcome, you may approach the CPE’s Student Services Centre (SSC) for help. Your complaint will be reviewed and you may be referred to the CPE Mediation-Arbitration Scheme. Fees are chargeable to both the student and the PEI for the dispute resolution process. For more information on the fees involved, please contact the Student Administration Manager. Seats are available in the programme you want to transfer to. You fulfill the requirements needed for admission to the programme you want to transfer to. Hyper Island assesses that you as a student is suited both academically and emotionally, for enrollment into another program offered by the Institute. You get necessary permissions such as student visa approved by the issuing governmental entity of your student location according to the transfer request (if needed). Ask for the Transfer Form at Student Administration. Contact and inform your Programme Manager. Ask your Programme Manager to sign the form to confirm he/she knows about your intention. Fill in and sign the Transfer form and hand it into Programme Administration. If your transfer is fully approved and accepted by you there is a transfer fee of 2.000S$ to be paid by you within 2 weeks after the signing of new contract (will be done if transfer is fully approved). You will get an invoice sent to you from Hyper Island. Hyper Island will firstly review if you fulfill the requirements to transfer (point 1-3 above) and will get back with an approval or non approval on your transfer request to you by email maximum 21 days after you handing in the Transfer form. If you have Singaporean citizenship and your transfer request is for a Hyper Island programme in Singapore your transfer request is approved. Hyper Island will terminate your current contract. A new contract will need to be signed by you and Hyper Island. When both parties have signed the new contract Hyper Island will update your information in the Student Registration System stating you are registered at the programme you applied to transfer to. You will receive all programme information needed by Student Administration at least 4 weeks in front of programme start. if you have either Singaporean or non-Singaporean citizenship and your transfer request is for a Hyper Island programme outside Singapore you might need to apply for a student visa or such in the country of the specific Hyper Island location. If you need to have a student visa or such you as a student is fully responsible to arrange for this yourself. Hyper Island will support you with the necessary formal documents needed from Hyper Island in relation to your visa application. Within a maximum of seven days Hyper Island will send you such documentation. If you get a student visa or such accepted your transfer is approved. You need to make proof of such information to Hyper Island. Please hand in original documents to Student Administration to make copies. Hyper Island will terminate your current contract. A new contract will need to be signed by you and Hyper Island. When both parties have signed the new contract Hyper Island will update your information in the Student Registration System stating you are registered at the programme you applied to transfer to. You will receive all programme information needed by Student Administration at least 4 weeks in front of programme start. if you have either Singaporean or non-Singaporean citizenship and your transfer request is for a Hyper Island programme outside Singapore and a student visa or such is not required your transfer request is approved. Hyper Island will terminate your current contract. A new contract will need to be signed by you and Hyper Island. When both parties have signed the new contract Hyper Island will update your information in the Student Registration System stating you are registered at the programme you applied to transfer to. You will receive all programme information needed by Student Administration at least 4 weeks in front of programme start. If the programme you apply for transferring to already have started/will start soon Hyper Island allow you to enter to the programme latest the beginning of the 3rd week of that programme. If later, you will have to wait until the next start date of the programme. Withdrawal from studies at Hyper Island can be approved based on withdrawal “during cooling off period”, “due to non-delivery” or “due to other reasons”. Hyper Island fails, for any reasons, to start the course on the commencement date. All other reasons for the student choosing to apply for withdrawal from a Programme are perceived by Hyper Island Institute of Higher Education, Singapore as “withdrawal due to other reasons”; for instance, be based on medical conditions or financial circumstances. If a withdrawal is approved by Hyper Island the original contract will be terminated. A student can be withdrawn from a Programme by Hyper Island due to psychological illness, drug abuse and violent acts as well as being caught breaking Singaporean law. Our Refund Policy relates to course withdrawal “Due to Non-Delivery” or “Due to Other Reasons”. The Policy is governed by the Student Contract entered into between the Institute and the student. Hyper Island Institute of Higher Education Management Team in Singapore formally reviews the Refund Policy every year. Hyper Island encourages students to provide feedback on the policy for potential improvement. Feedback should be submitted to Student Administration. The refund policy is communicated to all students and prospective students in the student contract, student handbook as well as on the Hyper Island Singapore website. Refund during Cooling Off Period. Hyper Island provides the student with a cooling off period of seven (7) working days after the date that the contract has been signed by both parties. The student will be refunded the highest percentage of the fees already paid if the student submits a written notice of withdrawal to Hyper Island within the cooling off period, regardless of whether the student has started the course or not. Hyper Island Institute of Higher Education Pte Ltd fails, for any reasons, to start the course on the commencement date. Hyper Island Institute of Higher Education Pte Ltd terminates the course before the course commencement date. 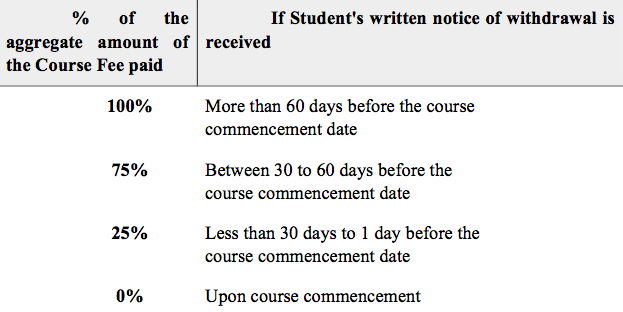 Hyper Island Institute of Higher Education Pte Ltd does not complete the course before the course commencement date. Hyper Island Institute of Higher Education Pte Ltd terminates the course before the course completion date. Hyper Island shall inform the student in writing of alternative study arrangements (if any) and also inform the student of their entitlement to a refund of the entire course fees and miscellaneous fees already paid should the student decide to withdraw, within seven (7) working days of the above notice. When a student has been accepted to transfer to another Programme he/she can be entitled to a refund of the course fee for the initial Programme. The eventual refund will be based on the same timetable as under 1b. Refund will be based on the remaining number of unconsumed course(s) from the date (of notice) of withdrawal in accordance to the stipulated timeline prior to the commencement of the next semester. Maximum refund of the last installment made is 50%. Any decision relating to refund of course fee arising from withdrawal in connection to transfer shall be made at the sole discretion of the Institute and that shall be final. ￼Upon which, the student concerned shall be informed in writing of Hyper Island’s decision. All students must be protected under medical insurance. All students will be covered under the Hyper Island Institute of Higher Education designated medical insurance plan. For claims, please approach the Student Administration Manager. Hyper Island has appointed AXA Insurance Singapore as our medical insurance provider.